Today I have a card for my Mum's Birthday that is in a few weeks. I had some fun water colouring using an Altenew stamp and die set. The photo and colours of the Altenew Challenge inspired me. I tried to follow the colours of the flowers in their photo even trying to blend the pinks so the edge was a slightly darker colour and the centre yellow. I stamped and die cut the flowers before water colouring them. I stamped the leaves and just popped up the flowers when dry. This water colouring was quite precise rather than the more arty look I usually do but it was fun to have a go. I think Mum will like the fresh look which I emphasised using the light green base. 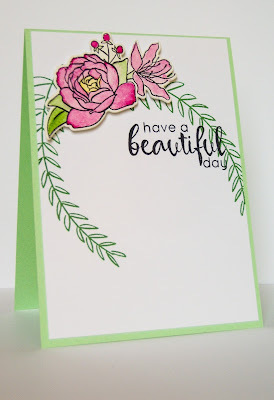 CAS-ual Fridays-Encouragement card-using the flowers as inspiration-my words would work well for an inspiration card as well as a Birthday card. Very pretty and fresh looking card that I am sure your mum will love. I love the Altenew stamps they always have the wow factor for me! Your mum is going to love this. So feminine and beautiful. Oooo these flowers again... Love them! If you've read my email from earlier you'll know I've also been watercoloring! The green card base really makes the pink flowers pop. Great job, so pretty! This is gorgeous Sandie. I love the way the green base brings everything together. Your mum will love it!!! Sandie, your card is very pretty. I love clean and simple. Thanks for joining us this week at Watercooler Wednesday Challenges. Sandie what a delightful and fresh CAS card. I really like the combo of the green card base and the white space of the card layer. Add to that the pop of colour from your watercoloured images and you've put together a great card. 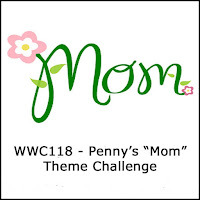 Thanks for joining us for the WWC116 Mom's Theme Watercooler Wednesday challenge this week. Hi Sandie! I love the elegance and CAS of this card! You did a beautiful job with this! Love it! Thank you so much for joining in for the WWC118 Mom's Theme Watercooler Wednesday challenge this week! I love this card Sandie - especially the way the leaves cascade down - beautiful. Thank you for joining in for the WWC118 Mom's Theme Watercooler Wednesday challenge this week! What a lovely card Sandie, and a great take on this week's inspiration! 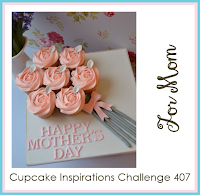 So glad you linked up to this week's Cupcake Inspirations Challenge! Lovely card, Sandie. That sentiment is meant for you. Have a very happy birthday! Sweet and lovely card, your mother will love it. CAS perfection, Sandie, as always! Beautiful colors and layout of the flower and leaves! You'll have a proud Mum! Thanks for sharing with us at CAS Watercolour! Wow so elegant and fresh looking! the colouring looks sooo good! Hope you had a blast yesterday and will enjoy today at the theater aswell! Really pretty and elegant and I love the coloured base card. The green card base is actually a great design detail, it goes so well with the leaves, I love how they hang beautifully from the top. Great positioning of both flowers and leaves. It's lovely! 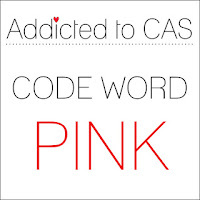 Another beautiful CAS card! Love the colors! Thanks for joining us at the first Calling All Sistahs Challenge! Beautiful your card! Thanks for joining us for the may2017 Calling All Sistahs Challenge. Your coloring in beautiful, Sandie! Thank you again for playing along with the Calling All Sistahs Encouragement challenge!